Many couples are opting for a small cutting cake with half sheet cakes in the back. Depending on your bakery, it can be less expensive and a good option if you're not really dessert people. It's no surprise that a lot of people like pies--I'm one of them! Having a table filled with pre-sliced pie options is a great idea! You know what else I love--hand pies or mini pies! Super delicious, bite-sized pie, what can be better?! Who doesn't love a display of assorted pastries?! There's usually a couple options and everyone has a favorite! I feel like donuts are all the craze right now and I definitely don't hate it! There are many boutiquey donut shops popping up, there are also the seasonal donuts from farms, and the homemade donut staple shops. Whether you're doing a donut wall, donut cake or donut holes, you cannot go wrong! Add in some specialty cider and it's a real crowd pleaser! Ice cream is probably my favorite, ever. Nowadays there are so many different ice cream options--you have ice cream trucks, ice cream bars, ice cream carts. Personally, there is nothing quite like some delicious Abbott's ice cream and their ice cream cart is fabulous, but that's just me! 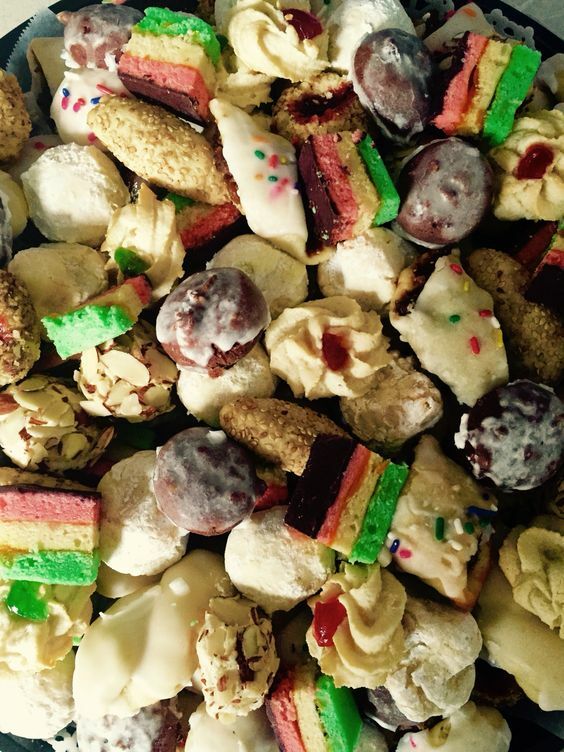 It goes without saying that there is an unwritten law that any Italian wedding must have Italian cookies. This is a lot of fun and a cool s'mores display really lights up guests' faces. If you have a lot of kids at the wedding, this is the way to go!! Whether they're regular size or mini--everyone loves cupcakes! I do recommend mini if you're having a bunch of flavors as guests like to try them all and this helps prevent waste! Having an assortment of fresh cookies is a crowd favorite! Add in some milk and it's game over! Another great option! There isn't many people who would turn down a beautiful macaron--especially when there are different flavors to try! I know a lot of couples that don't like traditional cakes/desserts and that's totally fine! A nice option would be having a candy bar filled with your favorite sugary treats! No matter what you do, you cannot go wrong! Don't forget, it's your wedding so the dessert should be whatever you two enjoy!